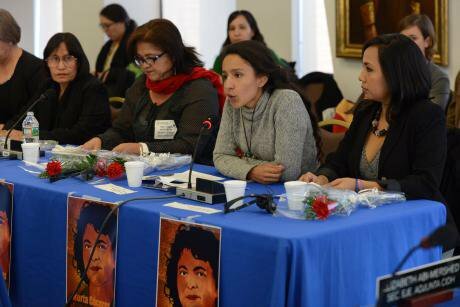 Berta Zúñiga Cáceres (centre), daughter of murdered activist Berta Cáceres. Credit: Daniel Cima/CIDH/Flickr. (CC BY 2.0) Some rights reserved. We need your help to investigate women’s rights and corporate power around the world. Apply for a 50.50 reporting fellowship. 50.50 is the section of the independent media platform openDemocracy.net covering gender and sexuality. We are looking for one part-time reporting fellow to work with our editors on stories related to extractive industries, corporate power, tax justice, and the rights of women, trans and gender non-conforming people. This fellowship aims to demystify how the global economy works and is in partnership with the Association for Women’s Rights in Development (AWID), as part of its project to share knowledge around economic justice. The fellowship will run for five months, starting 30 April 2018. The fellow will be expected to work on 1-2 articles each month, and to prepare for and attend weekly (virtual) editorial meetings. The fellow will be paid per piece produced, from £150 ($210) for a short article up to £300 ($410) for a more in-depth report. They will also receive ongoing mentorship and practical training. Workshops will be arranged, where possible, on topics such as Freedom of Information requests, interview skills, and feature writing, depending on the fellow’s projects and needs. Fellows may be based anywhere in the world. Previous experience in journalism, research, and multimedia storytelling is welcome. Most importantly, you are a creative, critical thinker and collaborative team player. We're looking for young women, gender non-conforming and trans writers with ideas and enthusiasm for original, feminist journalism. Applicants between the ages of 20 and 30 years old, living in sub-Saharan Africa and Latin America, with a passion for racial and economic justice are particularly encouraged to apply. This is not a full-time position, and can run alongside other responsibilities. You should be able to dedicate approximately 7-8 hours to this fellowship each week. You must be comfortable researching and writing in English (with other language skills of course welcome). You must have reliable internet access and be able to join virtual meetings (for example via Skype). Complete your application online by 23 March 2018 at 11:59pm GMT. Email claire.provost@opendemocracy.net with any questions, including “women’s rights and corporate power reporting fellowship” in the subject line. Note: If you applied for 50.50’s 'tracking the backlash' feminist investigative journalism fellowships, and would like to be considered for this position as well, you must re-apply through this form.